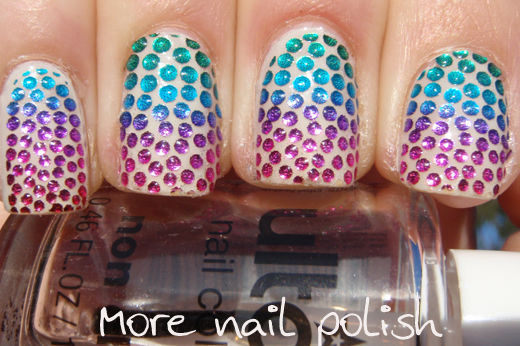 Cheap Aussie nail polish brand Ulta3, recently released these nail art nail stickers. Despite having never tried full nail strips, stickers or foils before, I just couldn't help myself and I grabbed a few packets. Here is my right hand. It seemed really strange to have completely different colours on both hands. One hand had warm yellows and reds, and the other had cool blues and purples. The packet comes with 16 stickers (in this case 8 of each colour). Each sticker is a different size. I noticed that all the stickers had about a 1mm border of clear sticker with no droplets on it. I didn't like the idea of having a gap around the sides and cuticle, so I trimmed that extra clear part off. 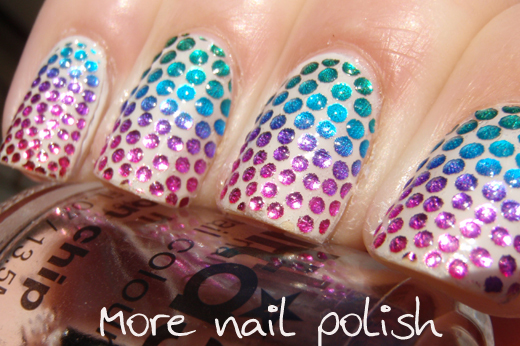 From go to whoa, these took me about 30 minutes to apply. My nail beds are quite long and I wouldn't consider my nails wide, but I did used the five largest stickers from each colour (except on my right hand pinky where I underestimated the width of my nail). Which leads me to one issue I had. Because these were all in a sheet where you just lift off each sticker when you want to apply it, I found it difficult to determine the right size sticker to use. Most of the stickers, foils or strips are in an individual nail shape which is much easier to line up and work out if its the right size. Being a single sheet on opaque white backing paper made it tricky. Once I had worked out which sticker to use, and trimmed the gap off, the application was really easy. They stuck down well and didn't wrinkle or crease on my very curved nails. I also found these rather stiff, especially when folding the free edge down to file off. I think I also filed a bit of length off when I was trying to file off the sticker end. I applied a coat of Seche Vite and wrapped my tips, although they still felt a little rough on the edges and I could have filed more. I only wore these for one full day (cause who can wear any nail polish for longer than one day - right?) and they did last very well. They didn't peel around the cuticle or nail edge but they did start to lift a little in one or two spots on the free edge. When I peeled them off they were super sticky still, and well attached, so I think they would have lasted at least another two or three days. The packet says 'lasts up to six days' I'm not convinced they would last that long. 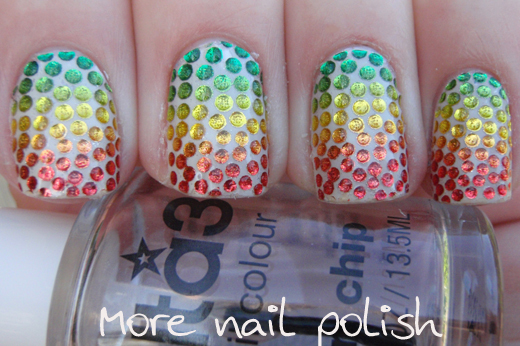 These nail stickers are $5 a packet, but you only get one manicure out of them. The left over strips might be good for feature nails or cut up for nail art, so I will hang on to them. Wow! I'm in love with these stickers! It's so pretty I love them! 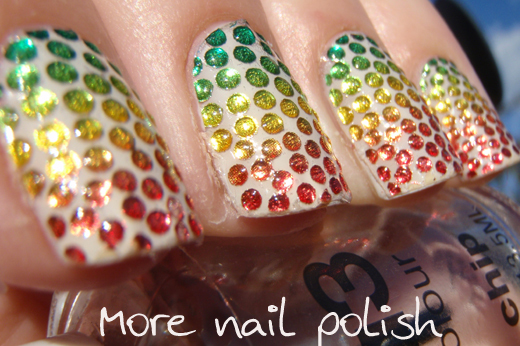 ooooooooooooooh i didnt know ulta3 does nail art stickers now! i definitely want to check these out. Love these!! 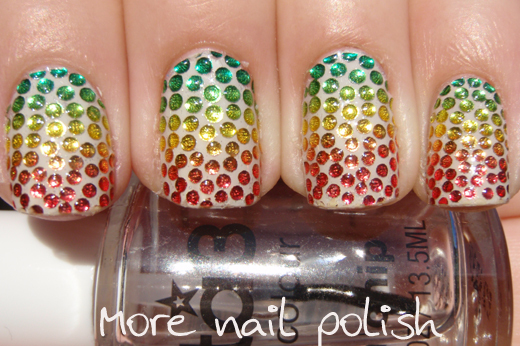 I posted these fabulous nails on our I Love Nail Polish FB page (linking back to you of course) and everyone loved them! I've got some of these too, I think I might have the same design. I diffident realise there where two different patterns in the packet. 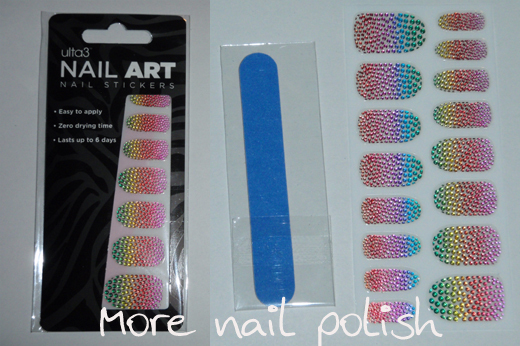 5$ is a good price, and you can use it to make french designs, not only to cover entire nails. I love this design! 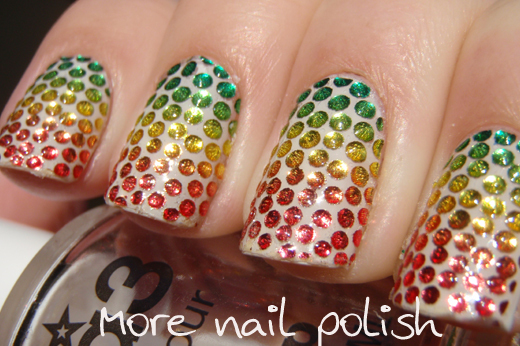 So pretty nail and polish nails... i lovely do much! They are cute. I think instead of putting different colors on each hand I would have mixed it up and put different colors on alternating fingers. Put a green/yellow/red one on one finger and blue/pink/purple on the next one and on and on. I think it would have been more equal that way. Or...you could buy 2 packages and put all of one color on both hands and then you would have the other color to do another mani. But...it is pretty odd the way they packaged it.